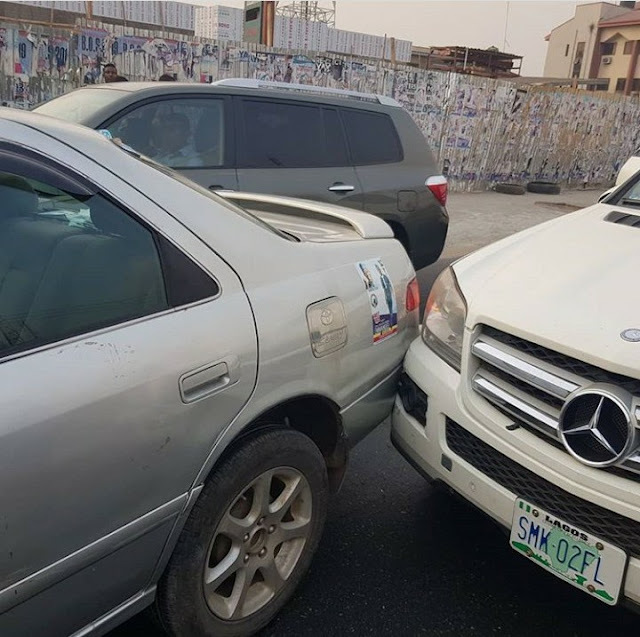 A Nigerian man whose Camry car was bashed by a Mercedes Benz owner in Lagos has called out popular singer Olamide for being the cause of the incident. Less than 8 Hours to January 1st 2019, i was driving home in my camry car from my office and on getting to idimu road, car watch bus/ stop precisely, i heard "Gbi" " Gbi" in a loud way which means a car coming from behind hit me from the back. I stopped almost immediately to approach the man who confidently sat in his Mercedes Benz ( Logo Benz) and i asked him why he jammed my car? He replied me by saying that he intentionally harmer my car because i overtook him and after few arguments some guys came around and began to support him after sighting logo benz and my small camry car�and this guy begins to boast that he would lock me in prison till January 1st for challenging him. Then two guys from no where approached me to beg him so that he will not deal with me. I insisted on my fundamental right and eventually left the scene and hand him over to God to judge him. This will be the second time logo Benz will intimidate me in Lagos but instead of me to steal pant because of benz i will rather work hard and double my hustle to earn more cash this year and buy my own legitimate luxury car @ my convenience. But i will not end this story by not correcting the bad influence of @olamide baddo and lil kesh for promoting rituals killings in their latest song among our youth. Olamide has succeeded in motivating Yahoo Boys from stealing ladies pants @ gun point to buy common material things that will eventually expire. I won't curse you guys but you will not last if you continue your ritual dealings. You will see one small boy of 17 years buying logo benz for his girl friend and parent. See, God judgement is very quick and ritual dealing expires quickly without notice. Some guys in those days killed their love ones to buy hummer jeep and even range rover that is now used to fetch fire wood from the market and vegetables and very soon the same Logo benz you are using ladies future to buy will be overtaken by latest trends.